What conditions does Zyrtec-D treat? Tell your doctor right away if you have any serious side effects, including: difficulty urinating, fast/irregular/pounding heartbeat, shaking (tremor), mental/mood changes (such as anxiety, confusion, nervousness, restlessness), weakness. List Zyrtec-D side effects by likelihood and severity. Before using this medication, tell your doctor or pharmacist your medical history, especially of: glaucoma, difficulty urinating (such as due to an enlarged prostate), high blood pressure (hypertension), heart/blood vessel disease (such as coronary artery disease), overactive thyroid (hyperthyroidism), diabetes, kidney disease, liver disease. What should I know regarding pregnancy, nursing and administering Zyrtec-D to children or the elderly? Tell your doctor or pharmacist if you are taking other products that cause drowsiness such as opioid pain or cough relievers (such as codeine, hydrocodone), alcohol, marijuana, drugs for sleep or anxiety (such as alprazolam, lorazepam, zolpidem), muscle relaxants (such as carisoprodol, cyclobenzaprine), or other antihistamines (such as chlorpheniramine, diphenhydramine). Does Zyrtec-D interact with other medications? 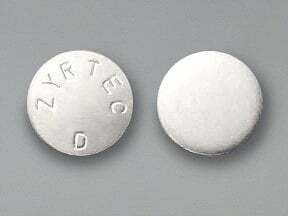 This medicine is a white, round, tablet imprinted with "ZYRTEC D". Have you ever purchased Zyrtec-D?